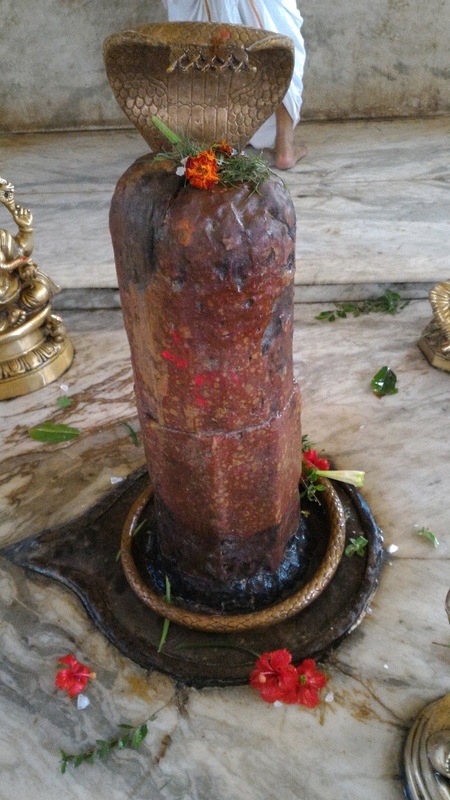 Today is Maha Shivaratri, a festival celebrated by Hindus and worshipers of Lord Shiva in India and all over the world.In Srimad Bhagavatham, there is a description of an incident which was churning of the Milk ocean called Samudra Madhana, where the ocean was churned using a huge Mountain called Mandara by demigods and demons.The same incident is mentioned in Mahabharata and Vishnu Purana.The churning of ocean was undertaken to unearth the Amruta or the Nectar of immortality.The great snake Vasuki was used as a rope to coil around Mandhara mountain, which was being used as a churning rod.As a result of the churning the ocean initially, a deadly poison called Halahala was released which looked as if it is going to destroy the whole world.During that time, to save the world and the living entities, Lord Shiva drank the whole poison and kept it in his throat. Due to which, his throat had became blue and hence, he became known as Neelakantha or the Blue throated one.Maha Shivaratri is considered to be the night on which Lord Shiva drank the poison and to glorify Shiva, people celebrate this night by offering prayers to Lord Shiva, reciting Rudram, performing abhishek to the Shiva Linga with sacred water, flowers, coconut water etc. One more austerity people would take up is, staying awake all night, reading or praying to Lord Shiva. 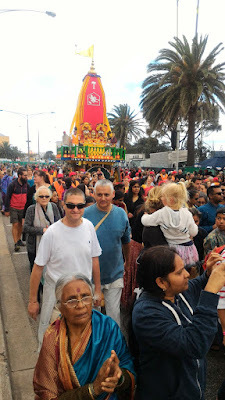 It is said that out of the Trinity of Brahma, Vishnu and Shiva, Shiva is in charge of mode of Ignorance or ahankara or the false ego that binds one to the bodily concept of life which in turn binds to the cycle of Birth and death. 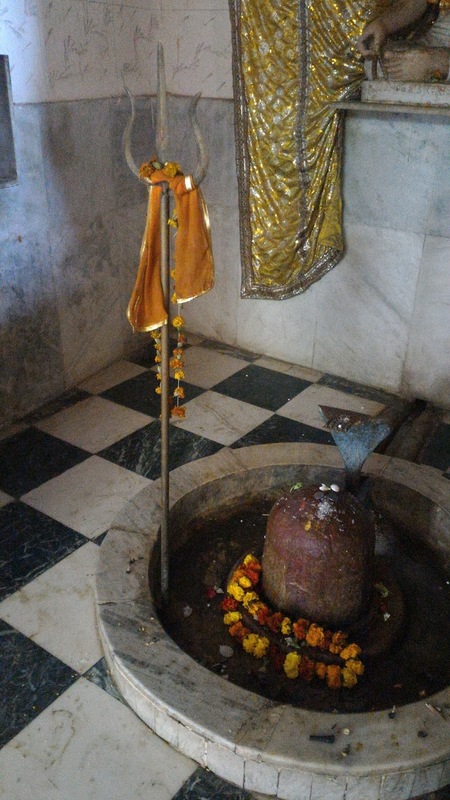 Srimad Bhagavatham mentions that, Lord Shiva is the greatest of all Vaishnavas (Vaishnavanam Yatha Shambu), one of the 12 Mahajanas and the position of him unique in the sense that Lord Shiva does not belong to the Category of living entities, Jivas including Lord Brahma and his creation and is the most powerful, second only to Lord Vishnu. Lord Shiva is neither an avatara nor avesha and is also not in between them. Lord Shiva is the greatest demigod, even greater than Lord Brahma. He is also a spiritual master having his own spiritual line called Rudra Sampradaya.Lord Shiva has connection with the material nature but Lord Vishnu (or Lord Krishna) is transcendental to material nature. The position of Lord Shiva is very beautiful explained in Brahma Samhita (Verse 45),”Just as milk is transformed into curd by the action of acids, but yet the effect curd is neither same as, nor different from, its cause, viz., milk, so I adore the primeval Lord Govinda of whom the state of Shambhu is a transformation for the performance of the work of destruction”. 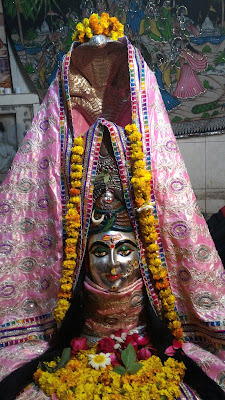 Thus, Lord Shiva who is in charge of mode of ignorance has connection with the material energy. 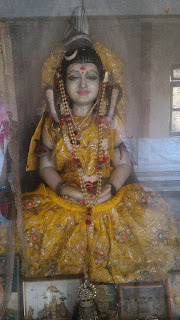 Parvathi or Durga who is in charge of material energy is his wife. Lord Shiva along with Ramadevi carries the glance of Maha Vishu to the Mahat Tattva for it, to be agitated. Mahat Tattva is the or shadow of pure consciousness, is the germinating place of all creation or prakriti, material world, including all the living entities in it. One day a friend of mine came to me and said the smoking grass should be made legal because, that is what some followers of Shiva in north India do. Then, I told him that the reason that Lord Siva drank an ocean of poison was for others' benefit.Some foolish people try to imitate this pastime but, instead of drinking poison, they take ganza and opium, which certainly ruins their physical and spiritual life. Why only smoking grass, I suggested him to try drinking few drops of poison because, that what Lord Shiva did. And, he hastily left the place without saying anything. 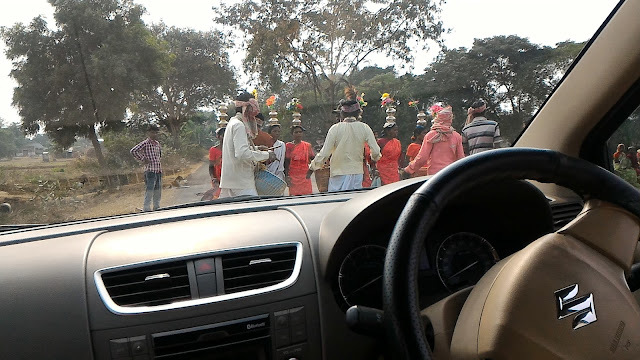 During my travels to Vrindavan and Mayapur, I visited many temples of Lord Shiva and thought, I will post some of the pictures here today. These days, You would find this happening everywhere. Humans being replaced by the self serve machines and systems. There is a Common wealth bank branch that’s opened in Melbourne CBD. No humans, only self serve machines. Go to a Fuel station and you don’t need to go in to pay. Just pay from where you are filling your fuel. And, there is even a TV that’s being played, so that you don’t get bored while filling your fuel. And, of course everyone has a smart phone these days that eliminates the need to even look at the person sitting right in front of you in a Tram or Train. And, all those online shopping and sales stuff. Don’t need to keep your feet out of your flat or Home. Time for a reality check. Do we all really ant all the Humans replaced by machines and internet?. What is the use of internet, if it is bringing someone thousands of miles away closer to you but, making you to ignore someone right in front of you?. ''Yes, yes''! I said. I told him how even grocery can be delivered at door now and how amazon delivers everything! When u r Mom fell down few days back while on her morning walk. Our local grocer saw her and immediately got his car to rush her home as he knows where I live. Would I have that 'human' touch if everything became online? I like to know the person that I'm dealing with and not just the 'seller' . It creates bonds. Relationships. Technology isn' t life ..
Labels: Human Relationships, Internet, Motivational & Self Improvement, Self Serve machines. 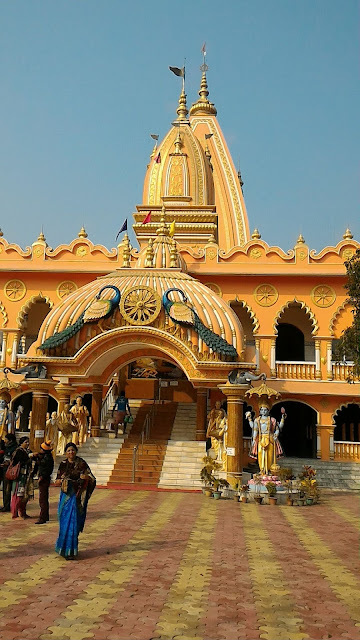 One of the places, I visited with my family during my recent trip to India is a holy place called Ekachakra which is a small village, located 20 km away from the town of Rampurhat in the Birbhum District of West Bengal.I along with my family travelled from ISKCON Mayapur by taxi and it is about 165 KMs from there.Took us a good 4 to 4.5 hrs time. The road journey was bit austere but that’s OK. I was told that compared to before, the road is much better now. This small village has a historical significance for couple of reasons. Firstly, the five Pandavas during their exile stayed here. And, this is where Bheema fought with the demon called Bakasura and killed him. Secondly, this is the place where, during the Mahabharata war, the wheel thrown by Krishna fell. 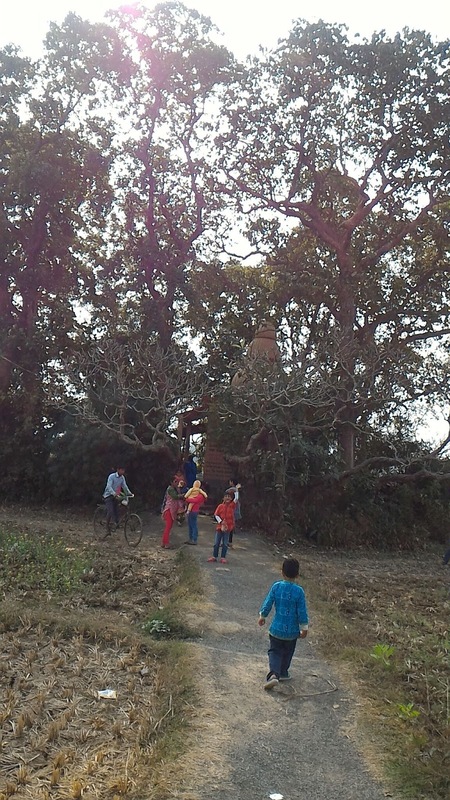 “EKA” means one and “CHAKRA” means wheel; thus this place is named as“Ekachakra”. to use as a weapon in Mahabharata War?. On the ninth day of the Mahabharata war, Lord Krishna notices that the valor and strength of Bhishma is increasing and where as Arjuna was becoming hesitant in fighting against his beloved Grand father. Thus, even though Krishna took a vow before the war that he will not lift or touch any weapon,yet he jumps from the chariot, picks up a Chariot wheel, charges towards Bhishma to kill him. Some of the reasons are to uphold the Dharma, protect his devotee, also to uphold a vow his another devotee Bhishma took (took a vow that he would make Krishna take up arms at least once in the war.) 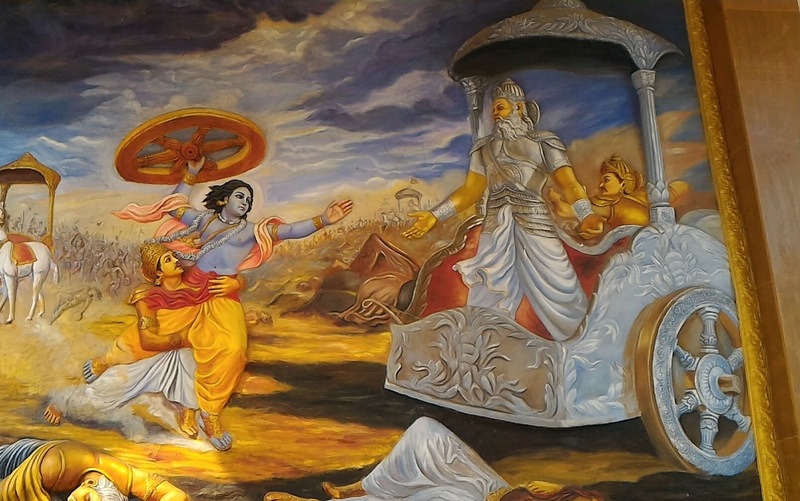 And, Krishna goes on to attack Bhishma with the a Chariot Wheel. Bhishma also understood that Krishna is staging an act just to uphold his vow, and lays down his arms and submits to Krishna to kill him. Then Arjun falls on the feet of Krishna to not break his vow and Krishna becomes pacified, throws away the Chariot Wheel and goes back. 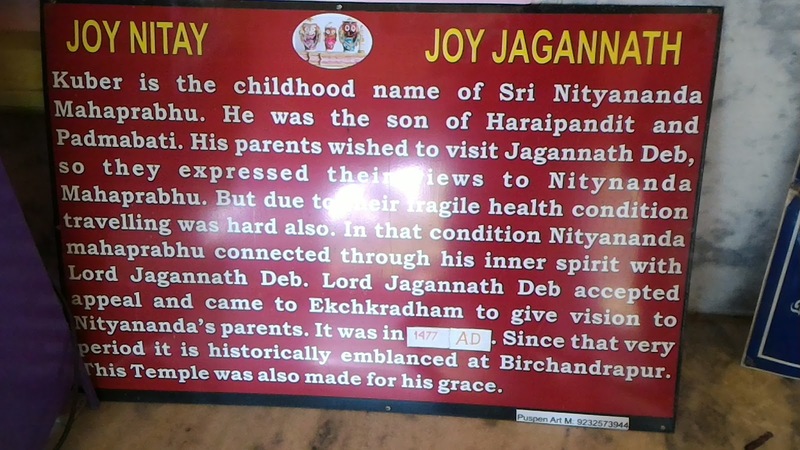 Also, Ekachakra is the birthplace of Lord Nityananda who according to Gaudiya-Vaishnava tradition called as ‘Nitai’ - 'Sri Nityananda', 'PrabhuNityananda' or 'Nityananda Rama' is an incarnation of Balarama, with Chaitanya Mahaprabhu being his eternal brother and friend, Krishna. 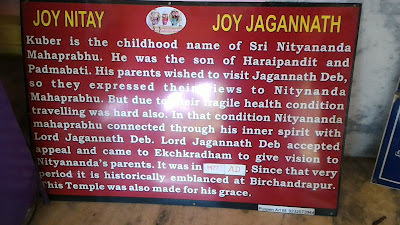 We have visited few places connected with the childhood pastimes of Nityananda. 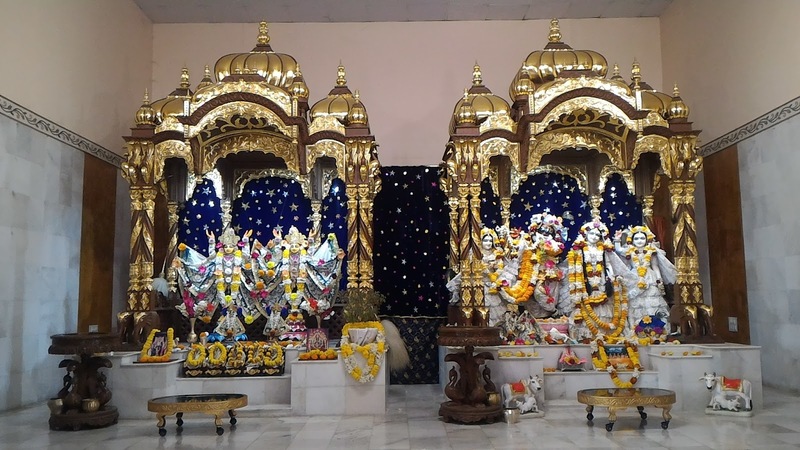 ISKCON Temple: This was our first destination and the temple architecture and atmosphere was amazing with beautiful presiding deities Gaur Nitai and Radha Krishna.The temple hall was aesthetically designed by wonderful painting of pastimes of Krishna. The temple had a ample place in the ground floor for serving breakfast and lunch for visiting devotees.We had our breakfast here and proceeded to see other places. 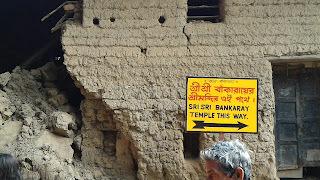 From here, we proceeded to the pandava tala, which is a short 10 mins walk from here. Pandavatala: This is where the Pandavas lived here with their mother, Kunti, when they were exiled to the forest. This area is bordered by several Keli-kadamba trees. 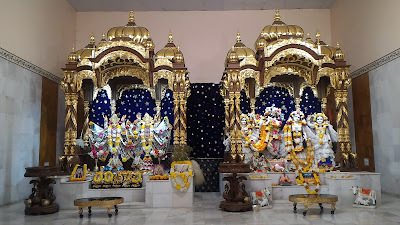 There is a temple with beautiful deities of Sri Sri Radha Krsna. 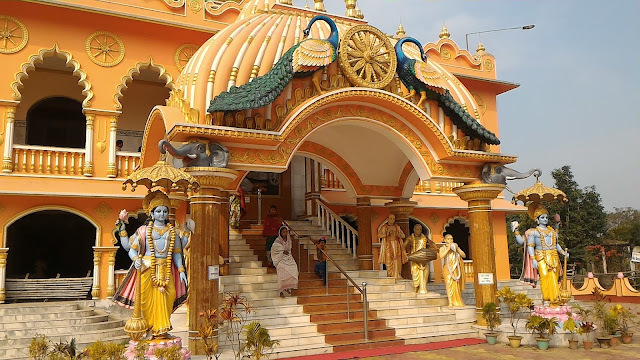 From here, we went to the birthplace of Lord Nityananda where even today, you can see Garbhavas (Sootika Mandir), The exact spot where Lord Nityananda appeared. 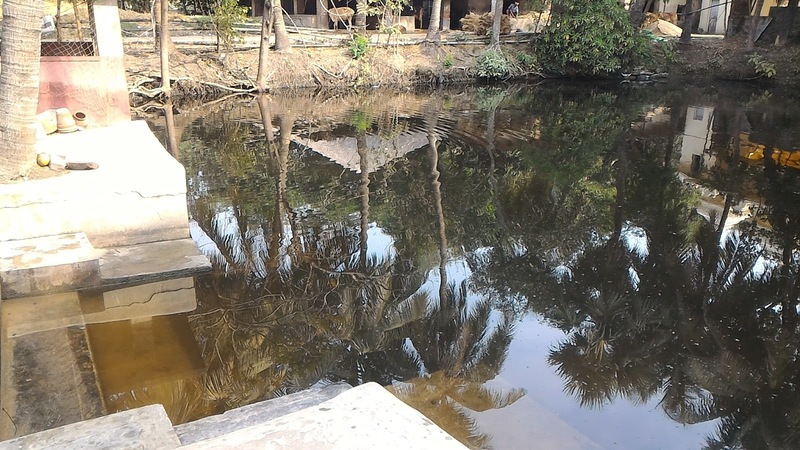 There is also a small pond, a Banyan tree where Baby Nityananda used to play with his friends.In these premises, there is a nice temple.In the main altar of the Temple is a deity of Lord Nityananda, a deity of Mahaprabhu to His left and a deity of Advaita Acarya to his right. Bankim Raya Temple: On the altar of this temple is Lord Krishna as Bankima Raya, who was originally established by Lord Nityananda. It is said that Lord Nityananda left this planet by entering into this Deity. Jagannath Temple: Again, this is a nice temple apparently the deities of Jagannath, Baladev, Subhadra are manifested by Lord Nityananda to fulfil the desire of his parents to visit the Holy Dham Jagannatha Puri. Kadam Khandi: Is the spot where Lord Nityananda recovered the Bankima Raya Deity from the Yamuna river. 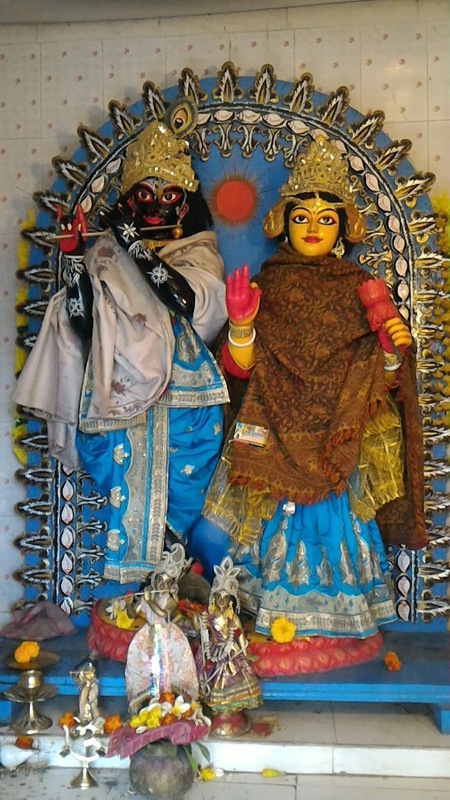 There’s a small Temple here with Deities of Sri Gaur Nityananda, Krishna Balarama and Sadbhuja Gauranga. Kundalal tala: This is the place where Lord Nityananda used his earring to block a hole, thereby preventing a snake which lived in it from coming out and troubling the residents of this area. Mouresvara Shiva Temple: This is an ancient Shiva temple where Sri Hadai Pandita (father of Nityananda prabhu) performed worship. On the appearance of Nityananda in Ekachakra, this deity roared and Advaita Acharya and other devotees could hear and understand the roar’s meaning at their residences in Mayapur and Santipur that an Avadhuta had appeared on Earth. There are few places, we have missed and could not visit due to the lack of time. 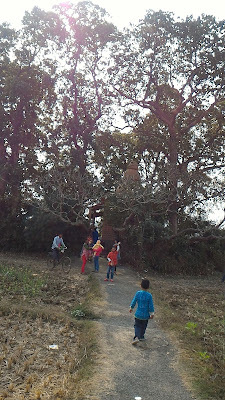 peace and tranquility of the place, not yet urbanised.You can have the strong spiritual vibrations of Lord Nityananda. I bought some photographs of the Original paintings of Lord Nityananda but, they have mysteriously disappeared and I am trying to find them, looking at all the Luggage and suitcases.Also, the breakfast and lunch at ISKCON was sumptuous and tasty.A must visit place for all the spiritualists.And, I forgot to mention, I read a board some where in Ekachakra to write the name of Nitai in the air and the merciful lord depending on your level of faith, fulfills your desires, purifies your heart, makes his presence felt, flows his mercy. After-all, Lord Nityananda Balaram is said to be the Kali Yuga Avatar of the savior of the most fallen. Happened to witness these Dragons and spectacular costumes on the eve of Chinese new year celebrations at the Footscray Vegetable Market. 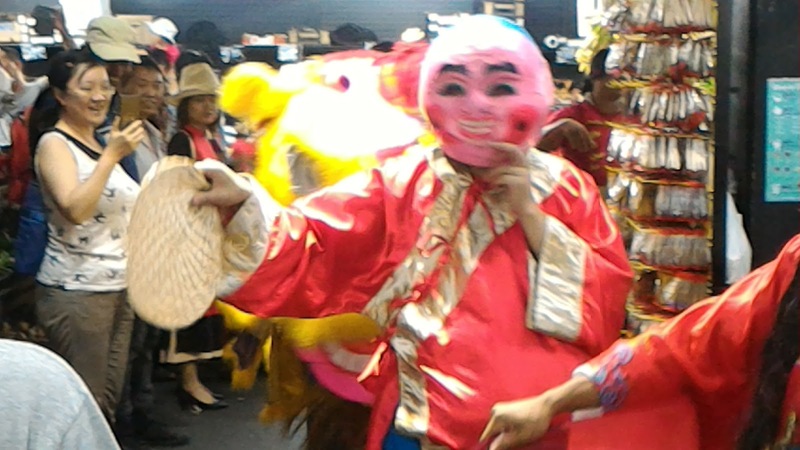 Also called as the spring festivals, it is one of the important festivals of China and many of the people of Chinese origin, all around the world. So this year 2017 is called as the year of the Rooster and January 28th is the first day of the Chinese Lunar Calendar. 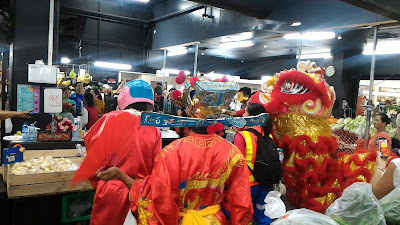 So there was traditional Chinese Music being played which I think are Cymbals and the each of Dragon I saw consisted of 4 persons, walking and dancing to the rhythmic sound of Cymbals. And there were others dressed in the traditional Chinese attire accompanying the two Dragons that I saw, a Yellow and a Red one. 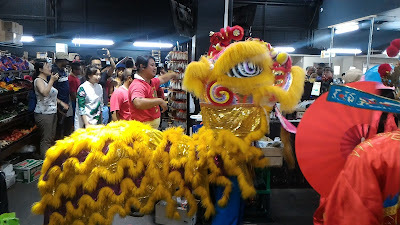 Surely, the Dragons changed the usually busy and business market place to that of fun and frolic. 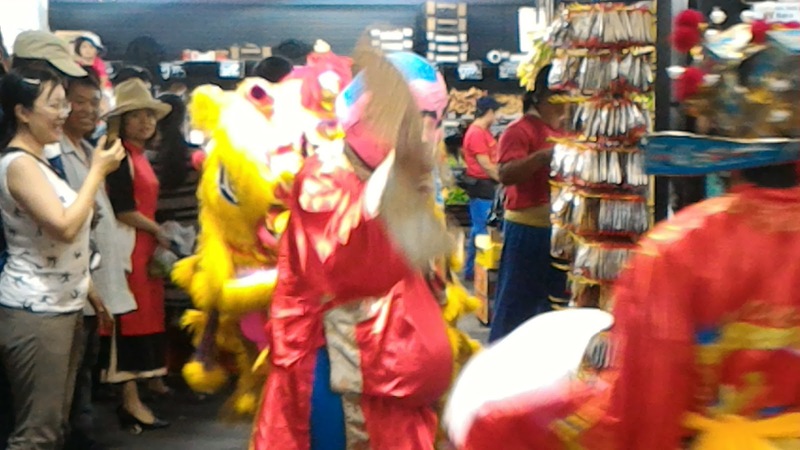 Labels: Chinese New Year, Footscray Market, Lunar Calender.